I received an advance copy of this book in exchange for a review on my blog. Fussy eating is a bit of a problem in our family, and I'm fully prepared to admit that it's my fault. Although I started out well with lots of different foods, when they started to show food preferences, over time I ended up sticking with the things that I knew they would eat. 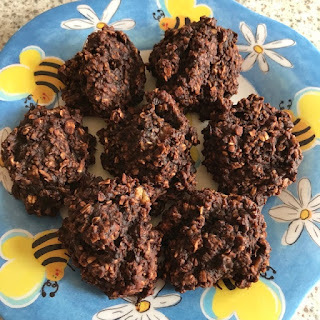 My husband and I don't eat a very varied diet ourselves, usually eating the same thing for breakfast and lunch and rotating through a small number of evening meals, so as long as I'm covering all the food groups I tend to stick to the things that I know and can cook easily. But now that the children are older and I have a little more time to spend thinking about and preparing meals, I'd love to introduce a bit more variety into our diets. In particular, as frequent travellers, it can become a problem when we want to eat out somewhere, and the children would rather simply not eat than try something new. 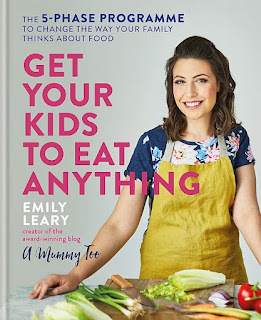 So I was very keen to try the new book Get Your Kids to Eat Anything by Emily Leary. 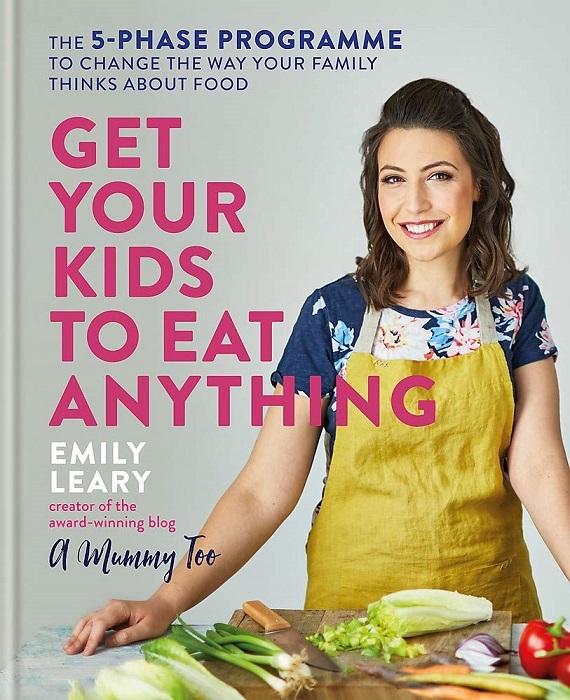 Emily has been blogging at A Mummy Too since 2011, and her blog is a fantastic resource for family recipes, with plenty of vegetarian choices - I've used several of her recipes in the past! Get Your Kids to Eat Anything is a 5-Phase programme that aims to change the way your family thinks about food. Phase 1 puts the unfamiliar into the familiar, working with the food that your children already eat happily and introducing some new elements. In Phase 2 you experiment with texture, taste and smell as well as understanding where food comes from and growing your own. Phase 3 helps you to discover the fun in food with some creative and exciting dishes, and Phase 4 pushes the food boundaries with some unusual flavour combinations. Finally in Phase 5 you learn techniques to make sure that these new habits stick and keep your family mealtimes varied long-term. Each of these phases includes a clear explanation of what you will learn and achieve along with two weeks of delicious recipes and activities to try with your family. It's early days yet, but I can really see how this approach is going to work. For example, my children eat a lot of pasta. In fact, they eat pasta for dinner most nights, rotating through a variety of sauces, perhaps with some peas on the side. I always use the same type of pasta - macaroni pasta - and I just get in the habit of chucking a couple of bags in my trolley each week. 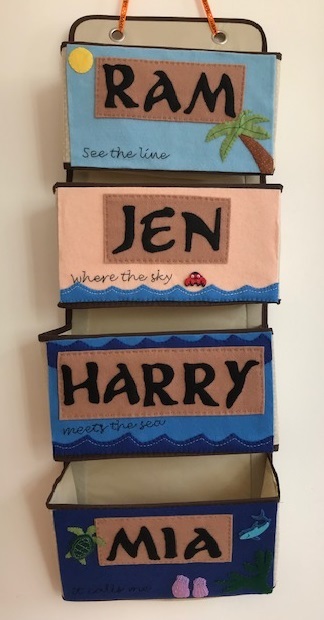 In Phase 1 you are encouraged to take a look at the food that your child will happily eat and think about different ways that you could vary that dish. Even something as simple as thinking about making the food a different shape, making a food a different colour, or adding a little extra flavour. It might sound basic, but it's honestly something that I'd never thought about before. So the very first thing that I did was to buy a bag of pasta in a different shape and serve it with the same sauce - and they ate it all up without a fuss! I've also been enjoying going through the recipe section and picking out a few to try. I couldn't resist trying the simple recipe for Healthier Chocolate Cookies above - with just a few simple ingredients they make a great, healthy alternative to a chewy bar or biscuit and were very quick to make. 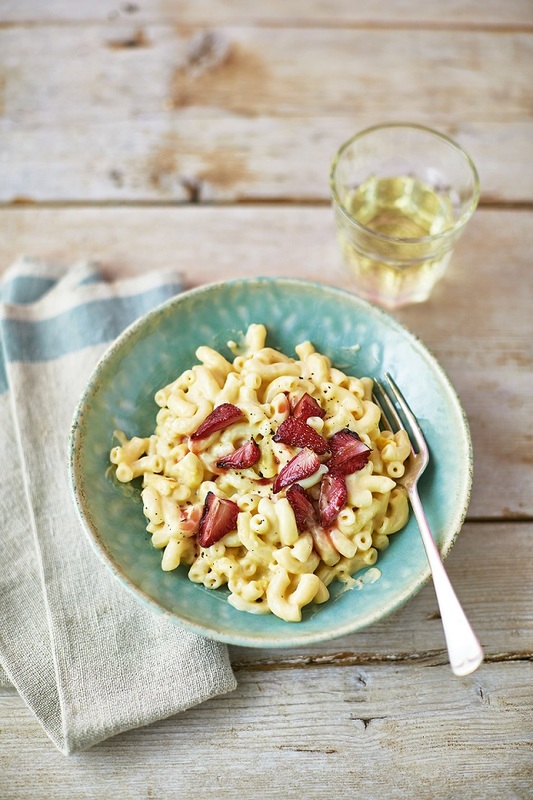 There's a huge selection of dinner recipes too, and being vegetarian I was really pleased to see how many suitable recipes there are, using a wide range of ingredients. I have a full recipe from the book to share with you. This recipe for Strawberries and Cream Pasta comes from Phase 4, so it's a little ahead of us yet, but the reason that I chose it is that it is based around a cheese sauce, which I can make easily and my children eagerly eat, but with a bit of a twist - roasted strawberries, again a fruit that my children love but served in a different way. Enjoy! Preheat the oven to 200C (400F), 180C fan, Gas Mark 6. Place the strawberries on a baking tray, season well with pepper, then drizzle with balsamic glaze. Stir, then place in the oven for about 15 minutes until the glaze bubbles. Set aside to cool. Put the butternut squash into a pan of cold water. Bring to the boil and simmer for 10–15 minutes until tender, then drain and set aside to cool. Meanwhile, cook the macaroni according to the packet instructions, then drain. Put the flour, butter and milk into a saucepan and place over a medium heat, whisking regularly for 5–10 minutes until thickened, then season. Tip the squash, Parmesan and white sauce into a food processor and whizz until smooth. Stir the hot, drained pasta into the sauce. Divide equally between 4 bowls, top with the strawberries and serve.